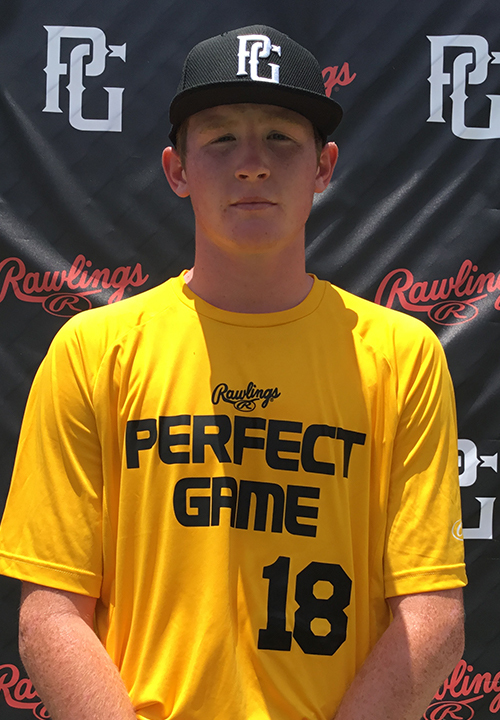 Riley Stanford is a 2022 RHP/3B, OF with a 6-3 170 lb. frame from Gainesville, GA who attends Buford High School. Large frame with an athletic build and projection throughout. Broad shoulders with some length. Primary righthanded pitcher with a side step delivery into a leg lift above the belt. Long and loose arm action in the back into a three-quarters release. Smooth and easy to the plate and can repeat with ease. Short drop and drive actions down the mound while generating extension to the plate. Fastball with plane topping out at 88 miles per hour but will drop slot down some and throw a two-seam fastball as well. Curveball has an 11-to-5 shape with sharp and late break. Will occasionally mix in the changeup as well. Smart on the mound with a good idea how to pitch. Righthanded hitter with an even stance. Utilizes a sweeping leg lift trigger for timing. Looks to stay on the pull side of the field while driving the ball in the air. Has present bat speed with strength at contact. Consistent hard line drives off the barrel. Excellent student as well. Named to the 2018 14U National Showcase Top Prospect List. Selected for the 2018 14U PG Select Baseball Festival.